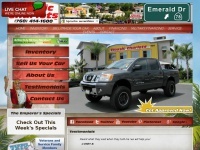 Classic Chariots is a dealership located near Oceanside CA. We're here to help with any automotive needs you may have. Don't forget to check out our used cars. four profiles were found for Classicchariots.net in social networks. Among other social networks the website is represented in Facebook, Twitter, GooglePlus and Pinterest. The web server used by Classicchariots.net is located in Wilmington, USA and is run by E.I. du Pont de Nemours and Co.. This web server runs 4 other websites, their language is mostly english. The Classicchariots.net websites were developed using the programming language PHP and served by a Nginx server. The website uses the latest markup standard HTML 5. The website does not specify details about the inclusion of its content in search engines. For this reason the content will be included by search engines.